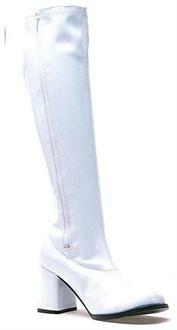 Take a walk back in the 60's with these authentic white patent leather look polyurethane zip up boots. WOW! 19 inches tall with a 3 inch heel. Size 10.Take a walk back in the 60's with these authentic white patent leather look polyurethane zip up boots. WOW! 18 inches tall with a 3 inch heel. Size 12.Take a walk back in the 60's with these authentic white patent leather look polyurethane zip up boots. WOW! 18 inches tall with a 3 inch heel. Size 13.Take a walk back in the 60's with these authentic white patent leather look polyurethane zip up boots. WOW! 18 inches tall with a 3 inch heel. Adult size 5.Take a walk back in the 60's with these authentic white patent leather look polyurethane zip up boots. WOW! 18 inches tall with a 3 inch heel. Size 6.Take a walk back in the 60's with these authentic white patent leather look polyurethane zip up boots. WOW! 18 inches tall with a 3 inch heel. Size 7.Take a walk back in the 60's with these authentic white patent leather look polyurethane zip up boots. WOW! 18 inches tall with a 3 inch heel. Size 8Take a walk back in the 60's with these authentic white patent leather look polyurethane zip up boots. WOW! 18 inches tall with a 3 inch heel. Size 9.